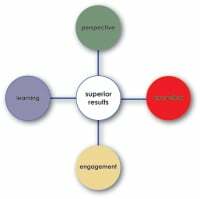 Fred Harburg created an elegant model that guides leaders to their best performance around coaching, thinking and organization dynamics. Based on the most recent developments in performance psycology, brain research and organizational culture, FACT-Based Leadership programs offer powerful, practical and amazingly pragmatic solutions for people in positions that demand high performance and executive thinking. Increase your competencies in developing the capacity and ability of your people. Align corporate culture and organizational strategy to maximize your company's competitive advantage.